UK was recently awarded a $11.2 million grant from the NIH to study metabolism and cancer. Video by UK Research Communications. LEXINGTON, Ky. (April 17, 2017) – The University of Kentucky was recently awarded a prestigious Centers of Biomedical Research Excellence (COBRE) grant to study the metabolism of cancer from the National Institutes of General Medical Sciences, part of the National Institutes of Health. The $11.2 million grant will fund UK's Center for Cancer and Metabolism over the next five years. Kentucky has disproportionately high incidences of both cancer and metabolic disorders and leads the nation in cancer deaths and is in the top 10 for highest obesity rates in the country. 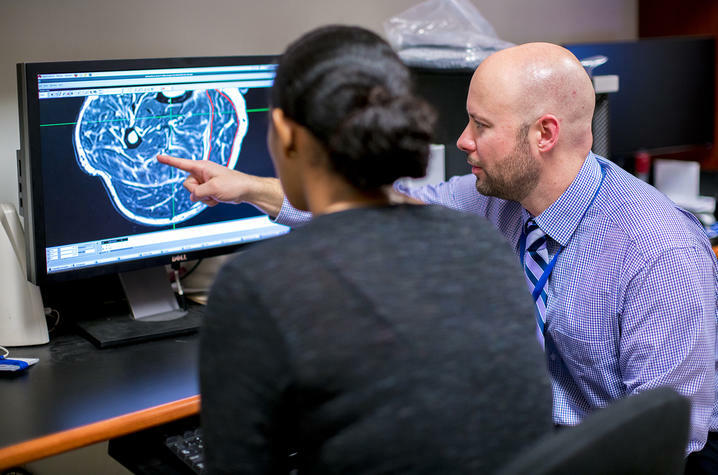 While scientists have long known of a direct link between obesity and cancer, the need for further research into this field is a necessity for Kentuckians. Senate Majority Leader Mitch McConnell, an advocate of the 21st Century Cures Act, contacted NIH Director Francis S. Collins on behalf of UK's grant application. “In an effort to improve health care access and outcomes for my constituents, UK has long made a priority of undertaking important research specific to Kentucky and the Appalachian region," Senator McConnell said. "Over the years, UK and its Markey Cancer Center have developed one of the strongest cancer research, prevention and treatment programs in the country, as demonstrated by the Center’s 2013 NIH National Cancer Institute designation, which I was proud to support. I was also pleased to assist UK in securing this competitive grant to advance and strengthen this critical health research for Kentucky by enabling advanced research focusing on the development of novel therapies for cancer treatment." Kentucky Congressman Andy Barr echoed McConnell's sentiments, noting that support and funding for innovative cancer research remains a priority. UK's Center for Cancer and Metabolism (CCM) capitalizes on highly specialized institutional strengths in cancer and advanced metabolomics tools to focus on the underlying mechanisms that link dysfunctional metabolism to cancer. Recent studies have shown that the metabolic powerhouse of cells – the mitochondria -– can influence how aggressive a cancer becomes. UK has internationally renowned experts in the field of cancer and metabolism, and new state-of-the-art technology has improved the ability to understand how metabolism impacts cancer. The CCM will bring together highly complementary disciplinary strengths at UK in cancer, metabolism and data sciences, coupled with sophisticated metabolomics tools and advanced cancer imaging capabilities, to strengthen the university’s cancer research enterprise by providing a thematically focused multidisciplinary infrastructure dedicated to defining the role of metabolism in the development and treatment of cancer. COBRE grants also use this platform to develop promising early-stage investigators with enhanced skill sets in exciting new areas of cancer research and to enhance their success in competing for NIH grant support. The grant promotes collaborative, interactive efforts among researchers with complementary backgrounds, skills and expertise. The CCM is co-led by program directors Daret St. Clair, professor and James Graham Brown Foundation Endowed Chair in the UK Department of Toxicology and Cancer Biology, and Peter Zhou, professor in the UK Department of Molecular and Cellular Biochemistry. "Having the kind of environment where learning and collaboration are placed at the forefront is why we were chosen for this grant, and we hope to continue that throughout the life of this center," St. Clair said. "It will also enable us to reach out to new and talented researchers who want to come to UK to become new project leaders and continue the work we're doing." The scientific discoveries achieved through the CCM will continue to help the UK Markey Cancer Center in its mission to conquer cancer in the Commonwealth. As Markey prepares to renew its National Cancer Institute Cancer Center designation, and simultaneously compete to become a Comprehensive Cancer Center later in 2017, Markey director Dr. Mark Evers emphasizes the need for increased cancer research funding and continuing to push for new discoveries. "Nowhere in the country is it more important to have this level of cancer research underway," Evers said. "Kentuckians face a unique set of health issues, but we at the UK Markey Cancer Center are distinctly positioned to help solve the problem. 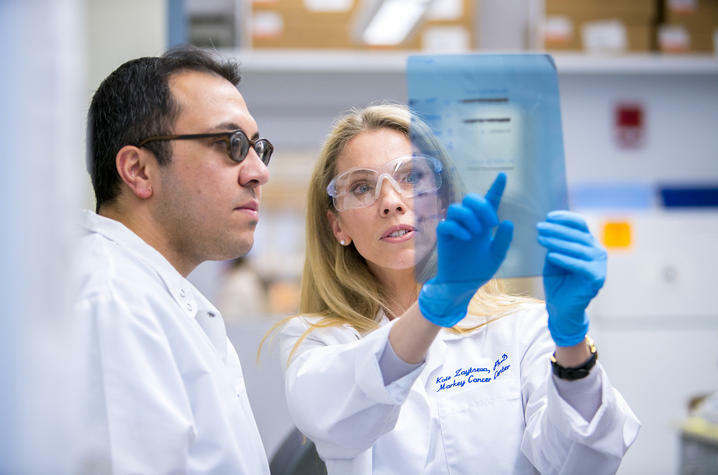 Being an NCI-designated cancer center means being a leader in research as well as clinical care and outreach. This funding will allow us to translate our findings into potential new therapies for cancer patients from Kentucky and beyond." The CCM leverages expertise with mentors and collaborators from across multiple UK centers, disciplines and departments. The multidisciplinary collaboration is indicative of the type of work ongoing at UK and UK HealthCare every day.